It has been a heck of a week so far. I did not get home from my out of town assignment until late last night. My doctors took me off of blood thinners for the first time in more than fifteen years. My wife’s car committed suicide so I am her chauffer until we can get a replacement. Tomorrow I start getting iron infusions at the hospital and they will continue weekly for the rest of the month. And this morning I am off to an meeting. Just writing that intro has worn me out so you got it, another reprint. I have often thought we sometimes are our own worst enemies. Sometimes we don’t want to risk a run at happiness because of our fear that we won’t find it. It is the old story of not wanting to fall in love because if it doesn’t work we will fail. So who do we hurt? We hurt ourselves. We can’t have peaks without valleys; life would be dull if it did not have its ups and downs. If you are like I am you bank happy memories to be brought out when needed and spend the rest of the time open to let happiness in. Have you ever felt so good that you did not want the moment to end? But eventually it did end, and cleared the way for an even better experience later. If the good times never ended, they would cease to be so good. Without change, without growth, without challenge, life would become stale and empty. Are you afraid to let yourself be happy because you fear that the happiness won’t last? Rather than worrying about when it will end, live it fully and then take the best of it with you. For when you fear losing your happiness, you’ll never have it in the first place. And so you really have nothing to lose. Yet you have everything to gain by living every happiness with richness and joy. For once you do that, the essence of that happiness is always with you, no matter what turn of events may come. Life is always changing, and what a blessing that is. Let the happiness flow without restraint. 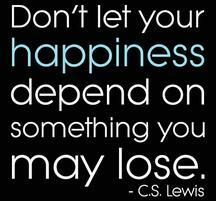 Happiness cannot be traveled to, owned, earned, worn or consumed. Happiness is the spiritual experience of living Anotherevery minute with love, grace, and gratitude. I’m writing an unauthorized autobiography. Three blondes were applying for the last available position on the Texas Highway Patrol. The detective conducting the interview looked at the three of them and said, “So ya’ll want to be a cop, eh?” The blondes all nodded. “You’re dismissed!” The first blonde hung her head and walked out of the office. The detective put his head in his hand and exclaimed, “Didn’t you hear what I just told the other lady? This is a profile of the man’s face! Of course you can only see one ear! You’re excused, too!” The second blonde sheepishly walked out of the office. Father’s Day was both a joy and a worry as my kids were growing up. I was always afraid they were going to give me a present that I couldn’t afford. Scientists have shown that the moon is moving away at a tiny, although measurable distance from the earth every year. If you do the math, you can calculate that 85 million years ago the moon was orbiting the earth at a distance about 35 feet from the earth’s surface. This would explain the death of the dinosaurs………………..The tallest ones, anyway. Intellect has its limits, stupidity knows no bounds. Can you see what he saw?